It must be tough, being a biographer. Carolyn Burke, whose book on American war photographer Lee Miller inspired a dramatic image-driven session at the Auckland Writers Festival a few years ago, decided her next subject would be the legendary French chanteuse, Edith Piaf. Much of her research entailed lengthy periods of time living in Paris. How ghastly. Then she heard of two men living in Marseilles who were obsessive Piaf collectors - so she had to go down to the balmy French Mediterranean coast to meet them. Twice. "They have the biggest collection of Piaf records, films, memorabilia of all kinds," says Australian-born Burke, on the phone from Santa Cruz, California, where she has lived for many years. "They even had her car. I sat at the wheel of her car and they had her little black dresses, her handbags. I was able to get as close to her in a physical way as possible. It was quite thrilling." Extremely thrilling, actually, for someone who has been enchanted by Piaf since she - Burke - was 19, and living in Paris in the late 1950s while she studied French at the Sorbonne. Piaf was in her mid-40s at the time, and alarmingly frail. "I lived in a maid's room on the top floor of a seven-storey building," Burke recalls. "I had to walk up seven flights of stairs. I gave English lessons to the family, and they called me La Miss. I first heard Piaf on the radio - I was very impressionable and thought, my, this is amazing. Then I learned from my French professor that he considered her an example of perfect French diction so I started singing along with Edith Piaf songs to perfect my French. "Piaf was still alive, doing what the French press called her 'suicide tour'. She was so ill, they were taking bets on whether she would die on stage. She did indeed fall quite ill that year and had to stop singing for almost a year but you heard her songs on the radio all the time and she was always in the papers." Ill as she was - arthritis and liver ailments after years of drinking and addiction to pain killers - the indomitable Piaf wasn't quite finished. As Burke relates in her book, No Regrets, the singer made a remarkable last surge, inspired by a song. "She wouldn't see anybody - she'd had several surgeries and long convalescences but she still wasn't doing very well," says Burke. "One evening the composer Charles Dumont came to her apartment with a new song but she wouldn't see him. Then she changed her mind and let him in - this is the story he told me in an interview - and he played the song we know in English as No Regrets. She perked up and said, 'play it again'. Gradually she sat up and called in her entourage. She had him play it 20-something times, all night long, and it had an unbelievably tonic effect." Piaf was convinced she could return to the stage and booked the Olympia Theatre in Paris to give a programme based on the new song. "Dumont wrote a lot of songs for and with her and so that is the story of how she revived," says Burke. "By the end of the year  she was back with a long run at the Olympia and everyone talked about her resurrection. She had sheer will and determination in great quantities." Other books have been written about Piaf's life, including her own "whitewashed" memoirs, The Wheel of Fortune, and an unreliable biography by the singer's lifelong friend (very much on and off), Simone Berteaut, aka Momone. "While Momone's account of Piaf's life was highly picturesque, not to say sensational, you have to use it with great care because she told a lot of lies to inflate her own importance," says Burke. Burke was fortunate because she came to the project at exactly the right moment. In 2006 the embargo expired on a huge collection of Piaf's correspondence held by the French Bibliotheque Nationale - the National Library. 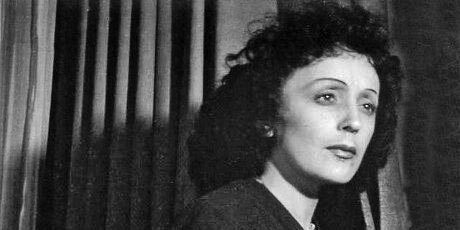 The letters were mainly between Piaf and poet Jacques Bourgeat, who the singer regarded as her spiritual mentor. But first, Burke had to gain several kinds of approval, not least of which involved etiquette, from the literary lawyer in charge of the Piaf Foundation in Paris. "I had to go over to Paris to see him. I speak fluent French and that certainly helps. I had several long interviews with him and he could see how I was thinking about the project and I guess that satisfied him. "I had some trepidation about being an outsider coming in and trying to work on this national icon. Because I have lived in France a lot, I also know something about how to behave and that really helped. If you don't follow the protocol and do things properly, the doors will shut." Access to the letters and the lawyer's full backing meant Burke's biography could include lengthy quotes from those letters, the first time they have been published in English. Piaf's words give an insight into a woman who was born and raised rough (her father was a tiny acrobat, her mother a drunk who abandoned her) but possessed a keen intelligence and a determination to learn. Burke was astonished to discover Piaf was fascinated by Greek philosophy. "It was a complete surprise. I learned that from the correspondence - it really allows us to see her in a new light. She talks to Bourgeat about Plato - you can't believe it. When she went to tour Greece after World War II she was quite disappointed that modern Greece was not the way she had imagined," she laughs. WHEN ELIZABETH Taylor was married to Eddie Fisher, she demanded that he read "improving" literature, and a similar, amusing detail emerges in the book that Piaf made her lovers, or "proteges", study the heavy philosophical works she thought were so important. For some, it was more than a struggle. "Some of them were not so delighted with Edith's reading list," Burke laughs, "but another thing I learned from the research and interviews was how generous she was with her proteges, how much she taught them. Yves Montand [one of Piaf's earlier lovers and a singer of French cowboy songs when they first met] owed an immense amount to her because she decided to pass on her own training. He'd been singing those cowboy songs in French until he met her. Then he became a huge star." It is staggering to read about the number of relationships Piaf had, and the fluidity with which she passed from one man to another. Burke admits even she was surprised. "I even thought of putting all their names in an appendix but my editor didn't want me to do that." She doesn't necessarily agree though that Piaf was essentially a lonely person. "To look at it from another angle, she was very adept at forming an alternative family through affinity, all those various musicians and impresarios, the people that gave her a lot of companionship. She couldn't bear solitude - but things didn't always work out so well with her men." The great love of Piaf's life, the boxing champion Marcel Cerdan (who was married), ended in 1949 when he died in a plane crash on his way to join the singer in New York. They had been together for less than a year. "I can think of only one thing, to join him," Piaf told Bourgeat in a letter quoted in the biography. "Their relationship was fraught to say the least, because he was married," observes Burke, "and they were both so famous they were hiding from the press. Who knows what would have happened? She certainly idealised him and the relationship." What the book makes clear was that Piaf was always searching for a "perfect love". Burke believes that may have stemmed from the abandonment by her mother. "Her mother left her when Edith was 2, although when she retold the story in later years, she made it worse by saying it was when she was 2 months old. Later on, when she was a success, her mother tried to profit by singing Edith's songs and extracting money from her all the time. I think that failed mother-daughter relationship must be at the bottom of her inability to accept that love is never perfect and it's always a set of compromises which must be more difficult when two entertainers are involved. She was searching for perfect love - not too likely to find it on this earth." When Piaf died in October 1963, her great friend, writer Jean Cocteau, said on state radio: "I never knew anyone who was less protective of her spirit. She didn't dole it out, she gave everything away ... only her voice remains." An hour later, he too passed away. Nearly 50 years after her death, Piaf's voice endures, her persona revered around the world, her singing copied by many, with varying results. "Piaf seems to present the virtues and the resilience of the little people, the spirit of battling on no matter what your circumstances are and finding your way," says Burke. "Another part of it is her extraordinary voice that is still so powerful. Practically all the female singers in France trying out for French Idol all learn the Piaf songs as if she is the gold standard and they have to show that if they are real singers they will perform Piaf." Born Edith Gassion, December 19, 1915, in Belleville, Paris. Her father Louis Gassion was a street acrobat; her mother Annetta abandoned them both when Edith was 2 years old. At the age of 14, she joined her father on his street performances, when she first started singing. She had a baby girl when she was 16; the child died of meningitis aged 2. Her singing career took off in 1935 when she was discovered by nightclub owner Louis Leplee, later murdered by crime mobsters. Her manager changed her name to Edith Piaf, cleaned up her image and her career started to soar. After the war she became hugely popular across Europe and the US. Married to Jacques Pills (in 1952; her friend Marlene Dietrich was matron of honour) and Theo Lamboukas (1962). She died of liver cancer in 1963. Carolyn Burke at Auckland Writers & Readers Festival. Carolyn will appear at the Aotea Centre at 10am on Friday. She is also conducting a research technique workshop, Goodman Fielder Room, Level 4, Aotea Centre, next Saturday from 1pm.